This site is intended to be a simple warehouse for information about me, projects of mine, and contact information. I'm a bioinformatics Ph.D. candidate at Penn State University, working with Anton Nekrutenko. My background is in biology, but I spend most of my work time writing genomics software. And in my free time, I like to experiment with different technologies and make tools for myself (like those on this website). My GitHub profile is where you'll find all my public projects not hosted here. The repositories range from little, unpolished personal scripts to peer-reviewed genomics tools. Current as of July 2018. My main project at Penn State. I wrote Du Novo, a tool for processing duplex sequencing data without a reference sequence. It's open source, and written in Python and C. It was published in Genome Biology: Stoler et al. 2016. You can find it in the Galaxy Toolshed here. 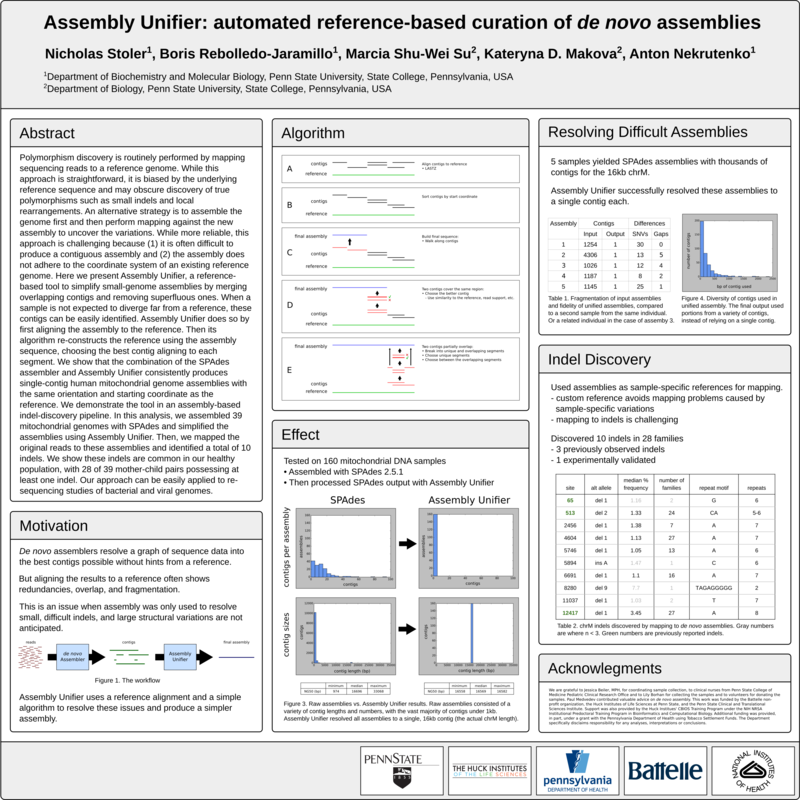 A tool I wrote to automatically "clean up" de novo assemblies, using information from the reference sequence. I wrote this when I was creating many small assemblies at Penn State, and I noticed many artifactual or overlapping contigs. It removes and merges them, respectively, and fixes other issues. I presented this work with a poster at Genome Informatics 2014 in Cambridge, UK. Another research tool from Penn State. The Variant Annotator is part of a pipeline for discovering heteroplasmies in mitochondrial DNA. It filters sequence data, uncovering low frequency variants. Its Galaxy Toolshed repository is here. It is described in papers in BioTechniques and Genome Biology. I contributed an analysis of mitochondrial indels to a study our lab published in PNAS in 2014. We sequenced the mitochondrial genomes of 39 families to examine the dynamics of mitochondrial inheritance. I developed a method to identify indels, using de novo assembly to customize alignment targets and reduce artifacts. A hackathon project from the Wikipedia Data Design Challenge 2017. Enter any Wikipedia username to see a graphic of their editing history every day for the past year. Yes, it's inspired by Github's commit activity graphic. Written with Python 3 and D3.js (thanks to Stephen Tung for the front end!). The website traffic logging and monitoring system I wrote when I first made this site. Now written in Python 3/Django. A project to produce a personalized graphic based on an individual's genome sequence. Written in Python, using the Python Imaging Library. Also in the Galaxy Toolshed (here). When Firefox Quantum came out, it broke compatibility with the Session Manager extension. I saw people saying they'd now lost access to all their saved sessions, so I wrote a little web tool to recover them. I got a few emails and tweets from people relieved that it saved their data. It's come a long way since the shared hosting, Perl CGI days. It's now run on its own DigitalOcean VPS, served by Nginx, with a front end written with Bootstrap 3 and the back end in Python 3, running on Django. See the code here.